in the physics of breath-hold diving, leaving many in need of a breath of fresh air, which can now be taken with Part 4 as we revive the soul, rinsing off the physiological fruit of breath-hold diving. As mentioned before, the human body was designed to breathe gas and function grounded on terra firma. We human beings, however, routinely flout this design purpose, as we concede to the temptations of exploring the everpervasive aqueous environment. The designer, with great foresight, added some physiological mechanisms that would allow this to occur without instant death greeting us as we plunged into the water. Therefore, without further ado, let us discuss these physiological implications as they pertain to breathhold diving. A lot of breath-hold diving starts with the diver already in the water: the breath-hold diver is either treading water in a vertical position (head out immersion) breathing atmospheric air, or floating horizontally breathing through a snorkel. Let us consider both scenarios in turn. In the head out immersion situation, the diver is breathing air at one atmospheres absolute (ATA) with the pressure in the lungs being slightly greater than 1 ATA due to the water pressure, with the lower parts of the lungs affected more than the uppermost parts. The effect of this is that the diver needs to actively oppose the water pressure by using more effort and accessory muscles in the chest and neck to produce a greater pressure gradient in order to allow air to flow into the lungs passively. Typically, the average additional effort is the equivalent of about 20 cm water. This increases the work of breathing and causes a reduction in all the lung volumes and capacities, including the functional residual capacity, expiratory reserve volume and vital capacity of the lungs. Due to a loss of the gravitational effect on circulation to the limbs and a mild hydrostatic squeeze on the limbs in proportion to the depth of immersion, there is an increase in the return of venous blood to the heart. The consequence of this increased central blood volume is that the heart’s overall output is increased by about 30% and there is an increase in the volume of blood pumped out on each beat. This, in turn, is associated with the well-known phenomenon called immersion diuresis or the “pee” effect. As we all know there are only two kinds of divers – those who say they pee in their wetsuits and those who say they don’t! A snorkeller typically experiences about a 30% reduction in breathing capacity as a result of the snorkel. The latter’s volume also increases the anatomical dead space (i.e. air or gas that has to be moved but does not take part in respiratory gas exchange) by about 350 mℓ for the average snorkel. Maximum depth limitations for breath-hold diving were initially thought to be governed by the ratio of the total lung capacity to the residual volume, as discussed in Part 3. Residual volume refers to the minimum volume of gas required in the lungs to keep them from collapsing (refer to the figure for a representation of lung volume). When the increasing pressure has compressed the initial lung volume down to the residual volume, a situation is reached where lung collapse will tend to occur. By determining the compression factor of the lungs from total lung capacity to residual volume, the estimated maximum breath-hold depth may be predicted using Boyle’s Law. Typically, the ratio is about 1:4 or 1:5. Accordingly, that would translate to about 30 to 40 metres sea water (MSW) (4 to 5 ATA, respectively). With some anatomical variations, a diver with slightly larger lungs and a smaller residual volume may be able to go deeper according to this principle. In reality though, significantly deeper depths have been achieved; therefore, the above mentioned mechanism cannot be the depth-limiting factor. 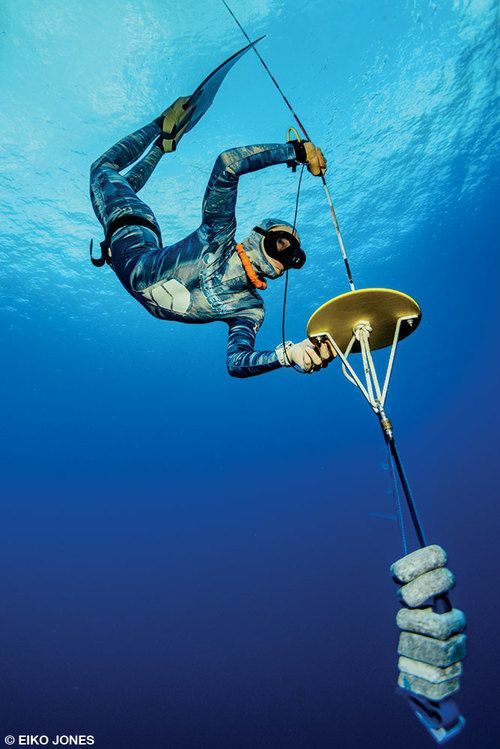 For example, the current no limits freediving world record held by the Austrian Herbert Nitsch is 214 m (22 ATA)! The present explanation is that compression of the lungs allows for pooling of blood in the pulmonary vasculature and the large intra-thoracic veins. Due to this redistribution of blood into the thorax, the chest cavity is buffered against the effects of compression by up to 1 ℓ of incompressible liquid, thereby increasing the maximum depth that can be achieved by trained breath-hold divers. Logically, the duration limits of breath-hold diving relate to oxygen stores and consumption in the body during the breath-hold period. The average 70 kg man at rest has a total oxygen store of about 1.5 ℓ and an oxygen consumption of about 300 mℓ/min. Based on that rate it would take about five minutes for the oxygen stores to be completely consumed during a breathhold. Practically speaking, most untrained normal humans can breath-hold for about one minute. Experienced breath-hold athletes can extend this by a number of methods, sometimes reaching in excess of seven minutes. Variables in breath-hold duration (or breakpoint) include lung volume, carbon dioxide levels and oxygen blood gas tensions as well as the psychological drive (motivation) of the individual diver. Of all these factors, arterial carbon dioxide levels are the most important. The rise in arterial carbon dioxide during a breath-hold stimulates centres in the brain stem or medulla, which stimulate a breathing response. Initially, one is able to suppress the urge to breathe wilfully but it eventually becomes involuntary. In trained breath-hold divers, there is a depressed ventilatory response to elevated arterial carbon dioxide, thought to be a result of decreased medullary centre sensitivity, a conscious suppression of the carbon dioxide stimulus or a combination of both. Dalton and Henry’s Laws predict that blood gas tensions will change with the partial pressure of the gases in the lungs during a breath-hold dive. Additional changes follow oxygen consumption and carbon dioxide production. During descent, the partial pressures of the gases in the lungs increase as the lung volume decreases. The reverse occurs during ascent. Initially, oxygen levels rise but during ascent they drop precipitously, with hypoxia of ascent (also called shallow-water blackout) being a feared consequence. It is worth noting that there will also be some absorption of nitrogen from the lungs during descent and time at depth. This is then released again during ascent and surface interval time. Although very rare, decompression sickness can occur with extreme breath-hold diving. Mammalian dive response/reflex (MDR) refers to a sequence and collection of physiological events that occur with breath-holding and immersion in water. The MDR is actually common to all vertebrates and is a complex of cardiovascular and metabolic adaptations to conserve oxygen during diving. The response is most marked in marine mammals. On land, during exercise, mammals will increase their breathing effort and their cardiac output. Contrastingly, marine mammals (as well as breath-hold divers) will hold their breath, decrease their cardiac output and limit blood flow to their peripheral areas. In this way, oxygen conservation is accomplished by a selective redistribution of the circulating blood volume to the vital organs. The diving response in humans is precipitated by two principal stimuli, apnoea (breath-hold) and water on the face. The colder the water, the greater the response. Fear can also heighten the response. Immersion of the face in water also causes a reflex apnoea response if not initiated voluntarily by the diver. In some cases, this can be so strong that the novice diver is prevented from taking a breath from a snorkel or demand valve. Bradycardia (slow heart rate) is the main cardiological component of the diving response with the heart rate dropping to as low as 10 to 15 beats per minute. During the first few seconds of the dive, there may actually be a brief increase in the heart rate, which then slows down to about 60% of the pre-dive rate. The heart rate remains low even when exercising underwater, especially in trained, young breath-hold divers. Simply immersing the face in water while breath-holding is almost as effective in producing the diving bradycardia as full body immersion and submergence. Aside from the bradycardia, arterial blood pressure increases as the heart rate progressively decreases in combination with an intense reduction of blood flow to the limbs within seconds of the exposure. Another component is the proposed contraction of the spleen thereby releasing additional red blood cells and thus extra oxygen carrying capacity into the blood stream. Thus, the diving response, elicited by breath-holding and immersion, is characterised by bradycardia, reduction of limb blood flow and a gradual rise in mean arterial pressure. Breath-hold diving by its nature induces anaerobic metabolism, especially in the skeletal muscle tissue where blood flow is reduced because of the diving response. This causes a build-up of lactic acid in the muscles with a corresponding small rise in blood levels, most notably towards the end of the dive. The skeletal muscles are tolerant of lactic acid build-up due to a good buffering (i.e. acid cancelling) system. The situation is quickly normalised on surfacing and breathing again in the recovery period, as the lactic acid is flushed out of the system primarily by the lungs, liver and kidneys. The beauty of the human body design is marvellously illustrated when we observe what happens to it at times of unaccustomed effort. Breath-hold diving is definitely unaccustomed effort, at least initially. It may become as natural as breathing (or not breathing) for those who fall in love with it. Do not miss the next part in this series, where we enter the “crime scene” of what can go awry in breath-hold diving. Brubakk, A. O. & Neumann, T. S. Bennett and Elliot’s Physiology and Medicine of Diving. 5th edition.